LLB student Thesara Jayawardane has been awarded a World Prize for Academic Achievements in Marketing by the Chartered Institute of Marketing (CIM). Whilst studying the first year of the University of London LLB at CFPS Academy of Legal Studies in Sri Lanka, Thesara simultaneously completed the Postgraduate Diploma in Marketing with CIM, sitting most of the examinations in her home town, Auckland, New Zealand. The award for Distinguished Performance 2012 was presented to Thesara as, out of all students worldwide who took part in the examinations and submitted a thesis to the CIM UK, she was identified as the World’s Top Student. Thesara was presented with this award at the CIM Graduation Ceremony held at Church House Conference Centre, Westminster, London. As well as studying towards an LLB degree and gaining a Postgraduate Diploma in Marketing, Thesara is currently in full time employment. 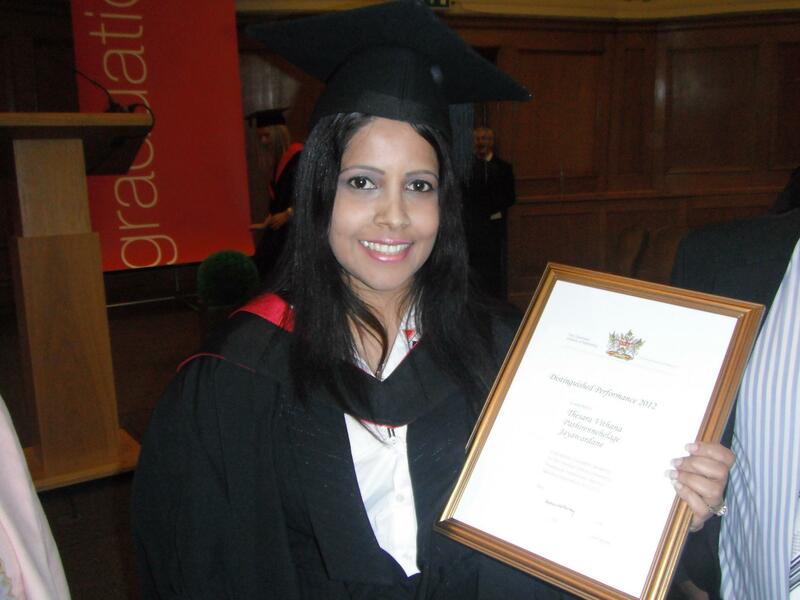 Many congratulations to Thesara from everyone at the Undergraduate Laws Programme! well done Thesara, i am very happy to be a woman. congrats!!!!! !